In this article the results of this four year trial showed that metalized reflective multch can deter psyllids from young citrus trees and increase their growth while reducing the bearing age and dramatically increasing yield. How Long Can Florida's Citrus Industry Survive? 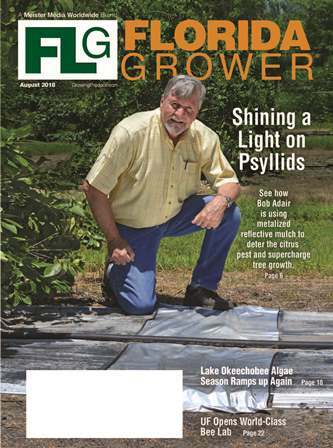 National Public Radio (NPR) article and radio story with Robert Adair, Executive Director of the Florida Research Center for Agricultural Sustainability, discussing thier metalized reflective mulch program. Robert Adair, Executive Director of the Florida Research Center for Agricultural Sustainability, was interviewed for the November 2nd, 2011 issue of Southeast Farm Press magazine. Bob Adair, executive director of the Florida Research Center for Agricultural Sustainability, was recently appointed to serve on the Fertilizer Technical Council by Florida Commissioner of Agriculture Adam Putnam. As the citrus industry representative for the 13-member council, Bob will advise the Department of Agriculture & Consumer Services regarding the administration and enforcement of laws and rules pertaining to licensing, inspection and regulation of the fertilizer industry. Recently I was interviewed by Southeast AGNET. I think this interview can give you a good idea of what¹s going on at the Florida Research Center these days. Some of you I haven't seen in ages and I thought this would be a good way to let you know what is going on at the Center. Others of you, I see all the time, but you may not know the details of our current projects. But I think all of you will enjoy the brief interview. FLARES monitors and charts the number of Diaprepes root weevils at its demonstration groves in Vero Beach with Tedders Traps arranged in a diamond-shaped grid. Two graphs have been created to chart these numbers. One counts the weekly abundance of Diaprepes. 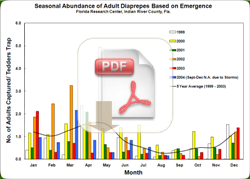 The other compares the numbers of Diaprepes from month to month from 1996 to the present. Bob Adair was recently featured on NPR’s All Things Considered about better ways to control the ever-growing list of citrus diseases. Currently at the top of the list is greening disease. He is the executive director at the Florida Research Center for Agricultural Sustainability, Inc (FLARES), where he works to innovate profitable and ecological strategies to sustain food and fiber production. To read the NPR article, click here. 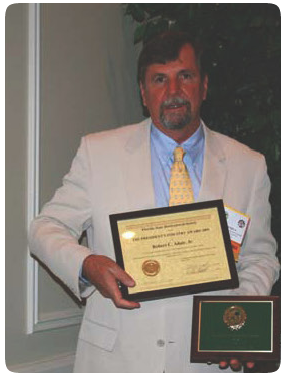 Robert Adair, Executive Director of the Florida Research Center for Agricultural Sustainability, was honored as the 2010 recipient of the Florida State Horticultural Society’s (FSHS) Best Paper Award for Citrus. Each year, this award is presented to the authors of the best and most meritorious paper in the citrus section of the FSHS annual meeting. The paper, title "Demonstration of a Sustainable Approach to Citriculture within a National Wildlife Refuge in the Indian River Area" was published in the journal Proceedings of The Florida State Horticultural Society. The award was presented to Robert and his coauthors, Ms. Beverly Norquist and Mr. Gregory Ross, also of Florida Research Center for Agricultural Sustainability, at the Society’s Annual Meeting in Crystal River, FL on June 8th, 2010. In addition, the same paper was also honored at the meeting with the President’s Industry Award as the best single citrus paper by an industry author. The Florida State Horticultural Society is the oldest active horticultural society in the United States and has been in existence since 1888. The Society has published over 100 years of Proceedings and the award winning scientific paper can be found in Volume 122, pages 90 to 107. The scientific paper, along with other publications, is available in our online Library.